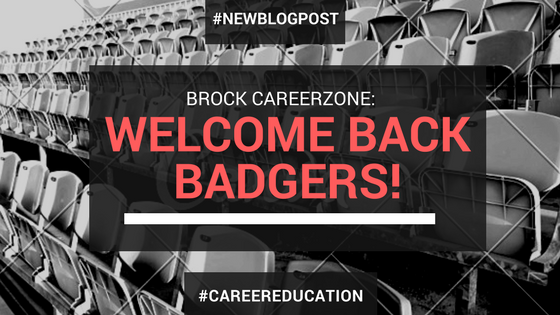 Brock CareerZone Blog: Welcome Back Badgers! We hope you're excited for another eventful year at Brock. As you're all getting back into your campus routine, we thought it would be a great time to update you on our center and remind you of the awesome services we offer at Careerzone. First off, our center has undergone some renovations and we are now located in Guernsey Market Hall. We are a free drop-in center, and will be open Monday-Friday 9am-4pm throughout the school year. Don't miss our events happening throughout the year. From our On-Campus Job fair to our faculty-specific career nights, there's an event for you! Stay up to date with what's happening by following us on social media or looking at our events calendar on careerzone.brocku.ca. Want to update your resume or get a second opinion before applying to jobs? You can drop-in to our center with a printed copy of your documents and we can give you some constructive feedback. Also make sure to take a look at our online templates to get ideas on how to format and what to include on your resume/coverletter! Landed a job interview? Why not go through a trial run before doing the real thing.. Book a mock interview with one of our full time staff and get feedback on your interview skills! We also have an online workshop and resources that can help you succeed! Whether you're looking for a part-time or full-time position, or even an internship, our staff can assist you! Our job postings are all located on careerzone.brocku.ca to browse, and we have tons of tips on how to effectively job search! Don’ t think you're in the right program? Not sure what you can do with your degree? Come in to the center and have a career chat with one of our staff members. We also have tons of career assessments and Degree Exploration Guides to help lead you in the right direction. These are just a few of the services we provide.. We have tons of information for Teacher Candidates, portfolios, going abroad, graduate school and more! Don't forget to login to careerzone.brocku.ca to access all of our online job postings, resources and workshops. Happy Homecoming!